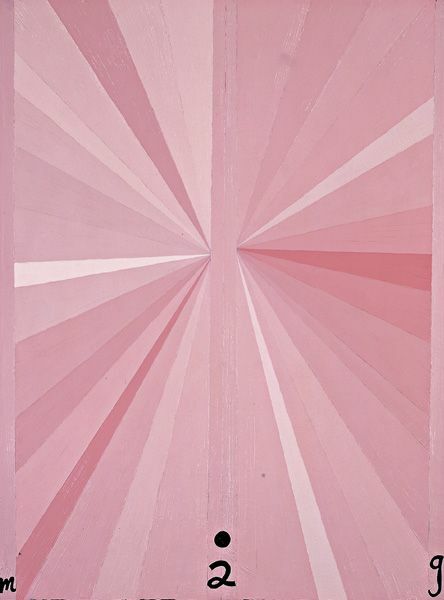 » AO Auction Results: Phillips de Pury, Thursday, February 12th; Satisfactory but not strong. 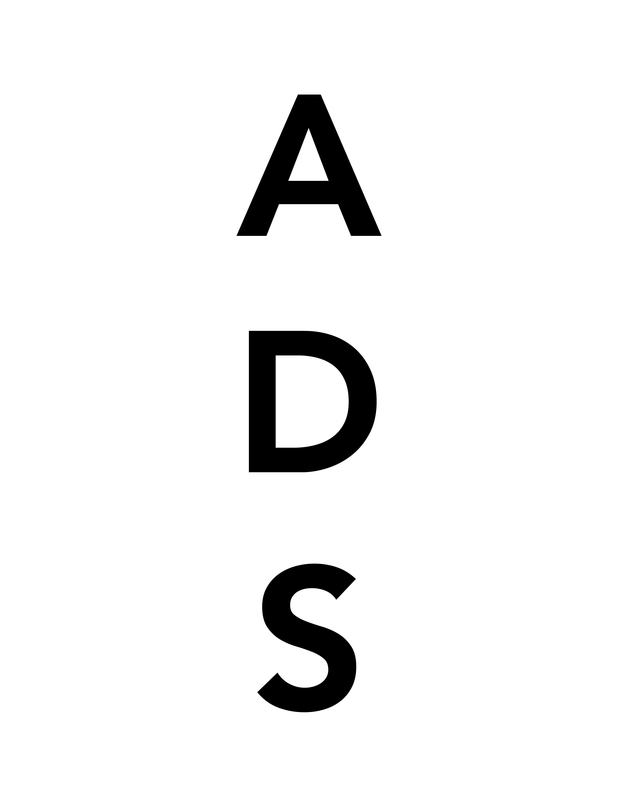 - AO Art Observed™ AO Auction Results: Phillips de Pury, Thursday, February 12th; Satisfactory but not strong. Home » AO Auction Results: Phillips de Pury, Thursday, February 12th; Satisfactory but not strong. 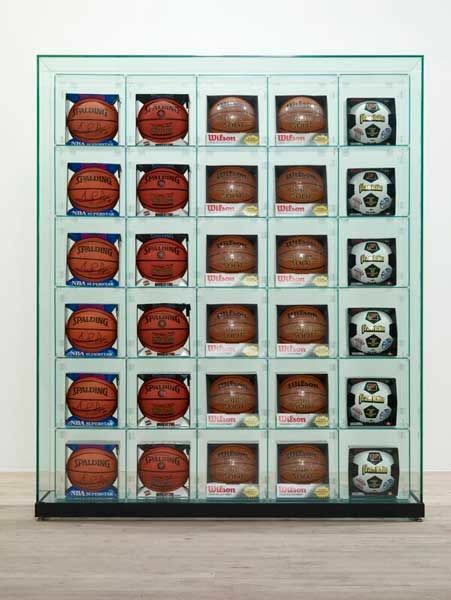 Encased — 5 Rows (6 Spalding Scottie Pippen Basketballs, 6 Spalding Shaq Attaq Basketballs, 6 Wilson Supershot Basketballs, 6 Wilson Supershot Basketballs, 6 Franklin 6034 Soccerballs) (1993) by Jeff Koons. Lot unsold. Estimate range: £1,800,000 to 2,200,000. Phillips de Pury & Co. raised a total of £4.2 million at their February 12th auction of contemporary art, with 35 of 53 lots selling. The entire sale was expected to realize £6.8 million – £9.3 million. The higher priced lots were shunned in favor of those with estimates under £500,000. The highest priced lot was Martin Kippenberger’s Portrait of Paul Schreber (Designed by Himself), which sold for £432,000, at the low end of its presale estimate of £400,000 to £600,000. The 8-foot high oil, lacquer and silicone is an abstract portrait of Paul Schreber, an early 20th century German judge who suffered several nervous breakdowns, and was the subject of a seminal clinical psychology paper by Sigmund Freud. 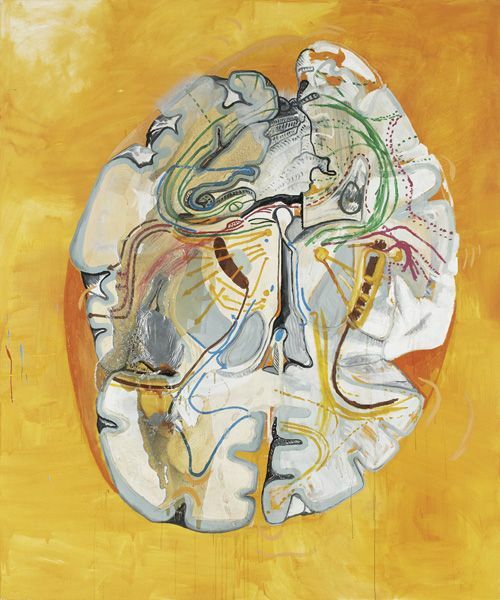 The portrait is based on a sketch in Schreber’s autobiography, where he draws what he imagines his brain to look like: one healthy side and one ill side. Dan Colen’s Untitled (Going, Going, Go. . .), of a candle whose smoke spells out the painting’s title, sold for £92,500, more than double the high estimate. This sale also set a new auction record for the artist. Zeng Fanzhi’s Huang Jiguang, from 2006, sold for £360,000 against pre-sale estimates of £200,000 to £250,000. The 11 foot wide depicts a Chinese war hero from the Korean War, who is famous for having sacrificed himself in a crucial battle. 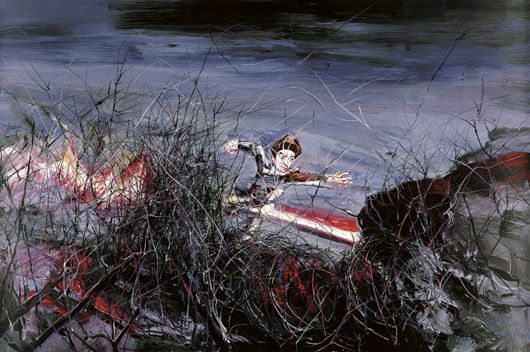 Mixing historicity and myth with an abstract landscape as background, Fanzhi is one of China’s foremost contemporary artists and is known for his Mask series. A Jeff Koons sculptural installation featuring a glass-encased vitrine stocked with various basketballs and soccer balls failed to sell. It was the only lot priced higher than £1 million, and failed to generate a single bid despite being the cover lot by a prominent name. The auction results were unimpressive on the whole, reflecting the general sense of ambivalent malaise that still plagues the art market. The consensus among many dealers and collectors is that it is a buyer’s market, and many sellers have not adjusted their pricing expectations to reflect the ongoing correction–until this mismatch is corrected, there will continue to be anemic auction results. Portrait of Paul Schreiber (Designed-by-Himself) (1994) by Martin Kippenberger. Sold for £432,000, against presale estimate sof £400,000 to £600,000. Other artists in the auction included the likes of Tracey Emin, Andreas Gursky, Banksy, Keith Haring, Jules de Balincourt, and Terence Koh. Tracey Emin’s two lots delivered mixed results, with one being withdrawn due to a lack of bids while the other sold for £18,000, below its £25,000 – £35,000 estimate range. The lots by Banksy and Keith Haring also went unsold, as did pieces by Jules de Balincourt, Ron Arad, Gilbert and George, and Terence Koh. Huang Jiguang (2006) by Zeng Fanzhi. Sold for £360,000 against pre-sale estimates of £200,000 to £250,000. 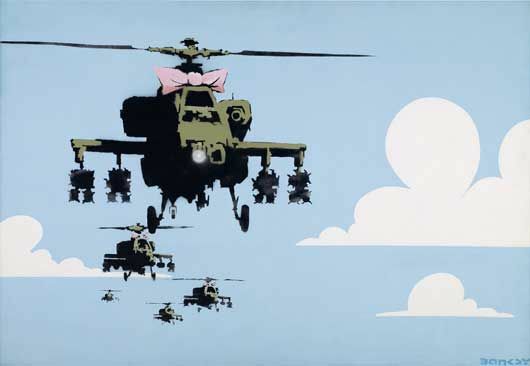 Happy Chopper (2005) by Banksy. Unsold. Estimate range: £200,000 – £300,000. 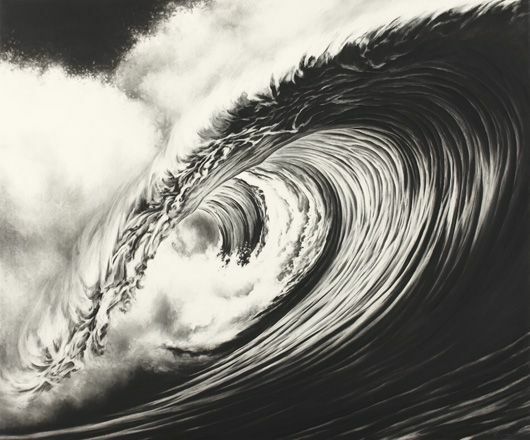 Untitled (Typhoon Reversed, Philippines 4-15-99) (2000) by Robert Longo. Sold for £74,000 against pre-sale estimates of £50,000 – £70,000. China seris no. 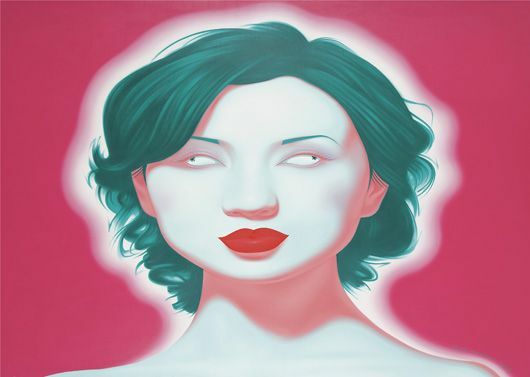 3 (2006) by Feng Zhengjie. Sold for £75,000 against pre-sale estimates of £40,000 – £60,000. 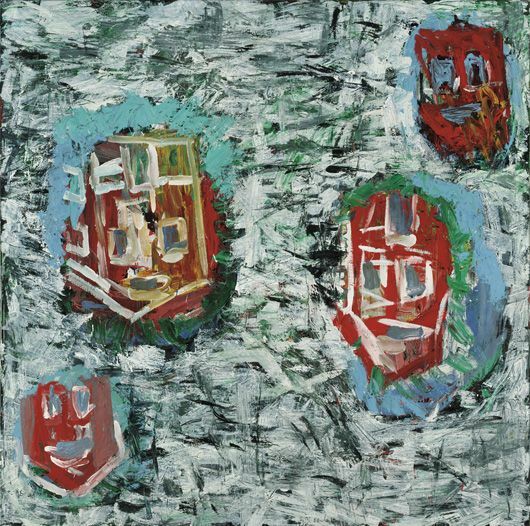 Horta de Ebro (1988) by Georg Baselitz. Sold for £179,000 against pre-sale estiamtes of £200,000 – £300,000. The Herald News – Joliet (IL) April 8, 2003 Breakfast bars, once considered an alternative to a bowl of cereal in the morning, are now popular throughout the day with flavor varieties that appeal to all ages. General Mills, a leader in the breakfast bar category, has a Milk ‘n’ Cereal Bars Variety Pack the entire family can enjoy, with flavors including Honey Nut Cheerios, Cocoa Puffs and Cinnamon Toast Crunch. Linda Brazzale of Plainfield married, mother of two General Mills Milk n’ Cereal bars are great when you need a breakfast on-the-go. The variety pack satisfies both kids and adults alike. They have the nutrition of a bowl of cereal with milk, however, they also have twice the fat. Although they are a nice alternative to granola bars, they are not something you can eat everyday. But, they’re great for traveling. Mark Bronson of Joliet single Forget about speeders to keep you awake. A cup of coffee and one of these bars will give you the jitters. The taste is really good on all three flavors, but these are loaded with sugar and calories. I would not recommend these for kids, although I am sure they would love them. For you adults looking for an afternoon pick-me-up, these are the bomb. I didn’t let the dogs try these because of the sugar, but I’m sure they would have loved them. This entry was posted on Wednesday, February 18th, 2009 at 1:37 am	and is filed under Art News. You can follow any responses to this entry through the RSS 2.0 feed. You can leave a response, or trackback from your own site.